Geoffrey Trease’s two books, The Seven Queens of England and Seven Kings of England have been captured the imagination and detailed all there is to know about many of our most famous monarchs. This time he has chosen the world of the theatre as the background for his lively portraits. Because there is no one convenient word for everybody who works in the theatre, whether as playwright or composer, producer or manager, actor, singer or dancer. Why these particular great figures whose stories are told in these pages? First, because they represent between them all the arts of the theatre. Secondly, because these men and women from different countries remind us that the stage-door stands open to both sexes and all nationalities. And thirdly, these seven lives link up to give an outline of theatrical history at all its greatest and most colourful periods: our celebrated characters are seen against famous settings — among them the Elizabethan playhouse, the Paris and Versailles of Louis the Fourteenth, and Drury Lane in the eighteenth century. Firstly, Geoffrey Trease clearly loves the number seven, since all his books revolve around seven figures. In Seven Stages he has selected an interesting group of players through which to chart the history of theatre, from the rise of the Elizabethan playhouses to the turn of the twentieth century. From the short length of the work, you will ascertain that these portraits are really only snapshots, yet they are skilfully done, and in the bibliography he offers suggestion for further reading. 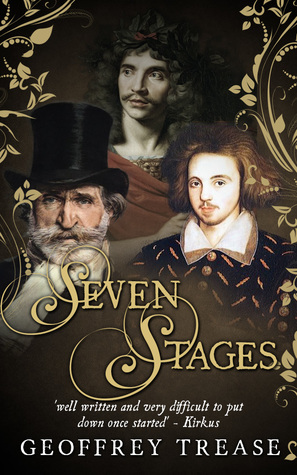 Overall, I found Seven Stages a delightful, fun review of the history of theatre and performance and I am certainly inspired to read more about several of the figures in the future.